It really does take a community to make a difference! We have such a community of partners (I call the PAWtners! ), champions and supporters for this tour. 42 days is the first leg of the tour, Alberta and BC. So far, we have presented at several schools, Rotary Clubs, community events, Boys & Girls Clubs, and stopped in at some pet friendly adventures and activities. 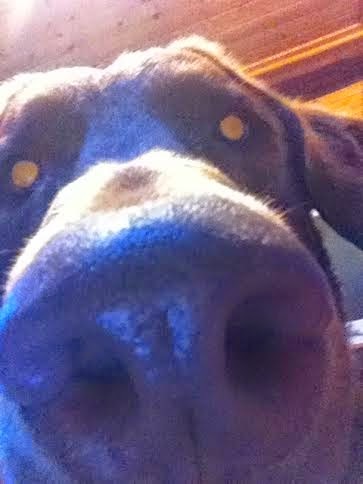 Doesn't this look like a PAWsome week? SSSHHHHSSSHHHH.... can you keep a secret? 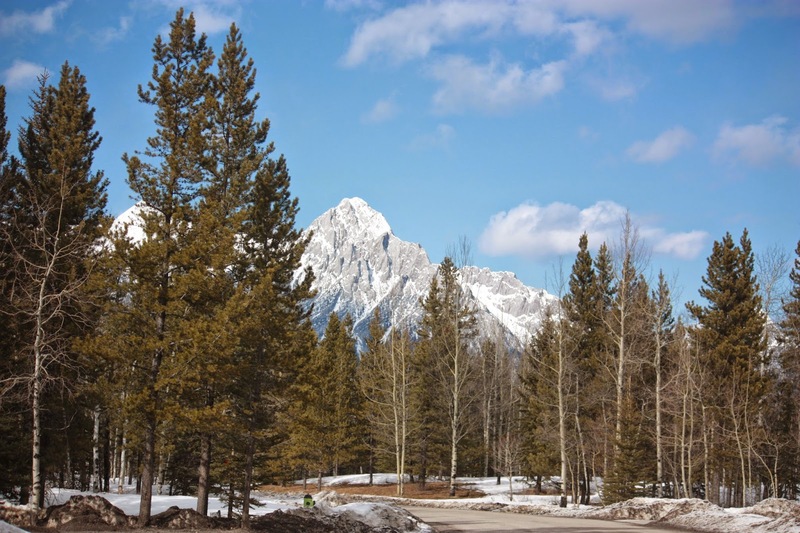 The Delta Kananaskis is going to be getting a Team Toby Tested Toby Approved Award. They are SO pet friendly! 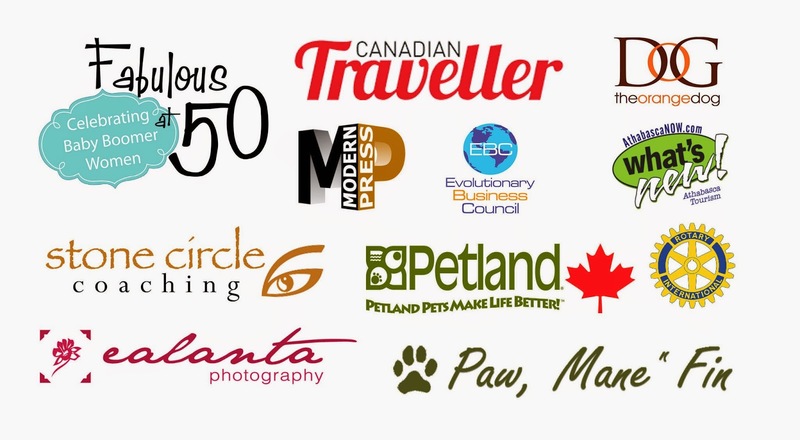 Again we want to shout out our partners on the PAWS Across Canada Tour, your support makes a difference! From the mouth of babes.... Kindness is the new cool! ....Just go ask a few children..... the experts! And the list went on... the get it! 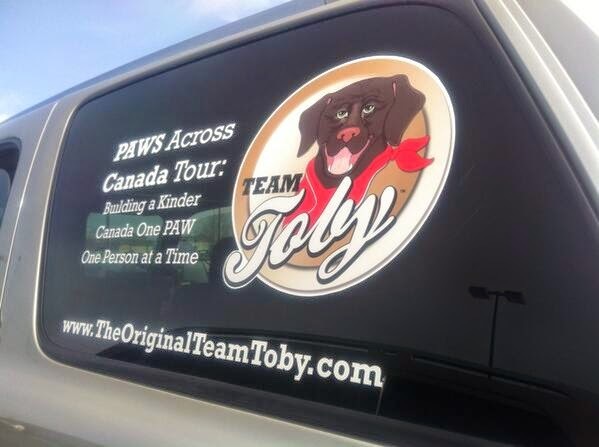 and scroll down to find out project Team Toby's PAWS Across Canada and click VOTE. Simple and your vote makes a difference! 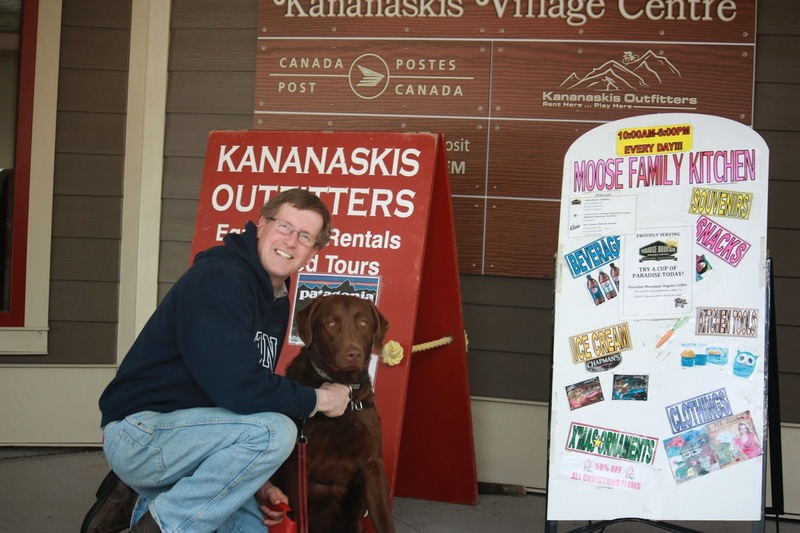 Thank you to our PAWS Across Canada Partners! We love you guys. 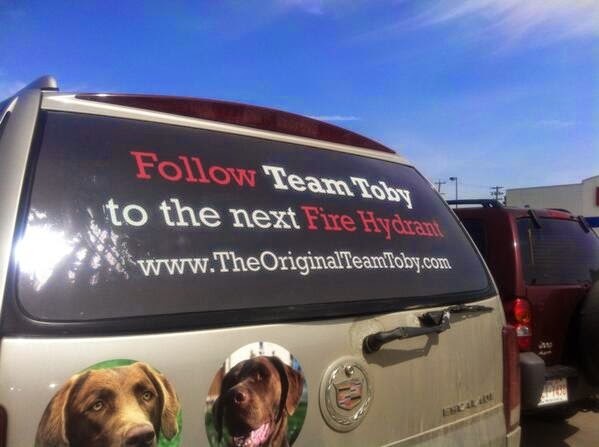 Orange Dog and Team Toby partner up for rescue dogs! 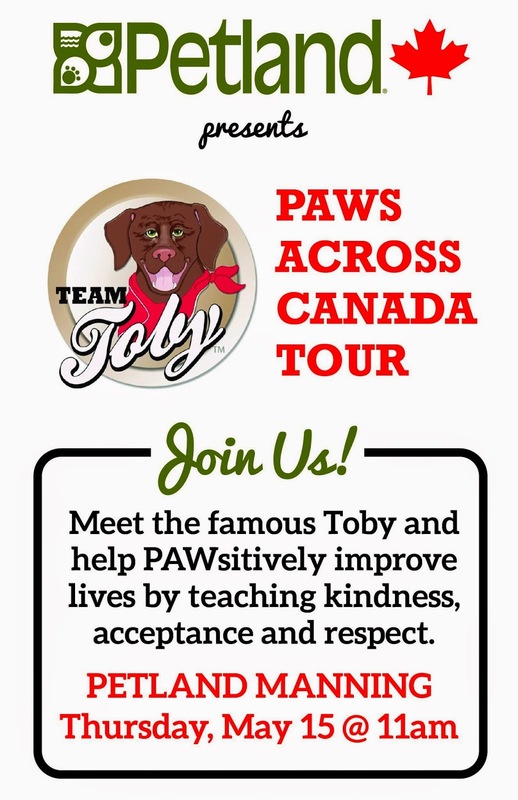 Team Toby’s PAWS Across Canada is two dog’s PAWsitive mission to build a kinder Canada one paw, one person at a time. 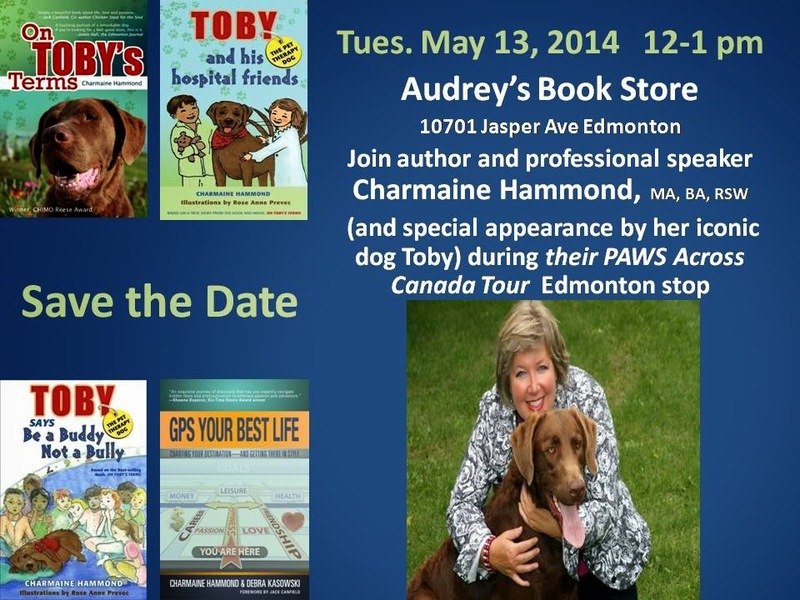 Toby is the star of several bestselling books for adults and children, is travelling the world with his pet parent Charmaine teaching lessons about kindness, acceptance and respect. RJ is the face of globally renowned Freedom Flights rescuing death row dogs from shelters and bringing them to loving forever homes in partnership with international humane organizations. 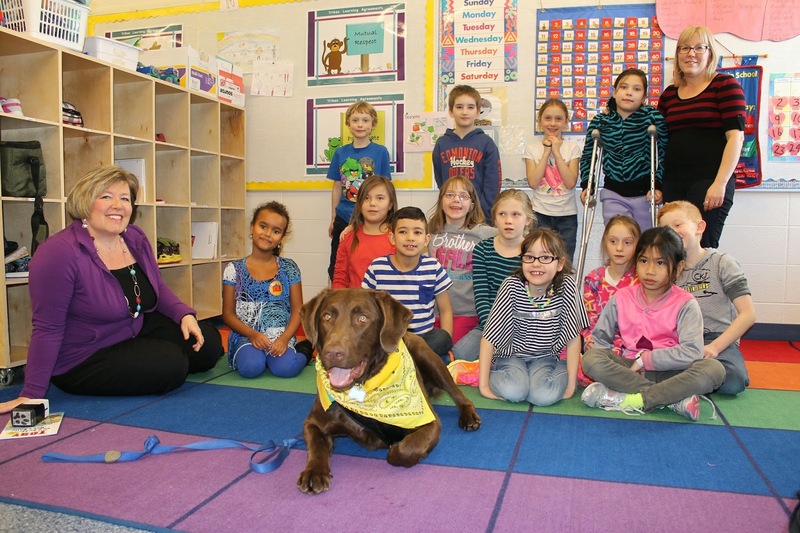 Their partnership will provide Canadian schools with classroom programs teaching children kindness values in a method that only the human-dog bond can communicate. These values instill the foundation needed to create a bully-free educational environment while Freedom Flights teach parents and communities the importance of responsible pet parenting uniting at risk dogs with families that have prevented the unnecessary loss of life. Imagine a Gulfstream jet, the epitome of luxury and success uniting the discarded dogs left for death with forever families anxiously awaiting their landing at Edmonton airport. 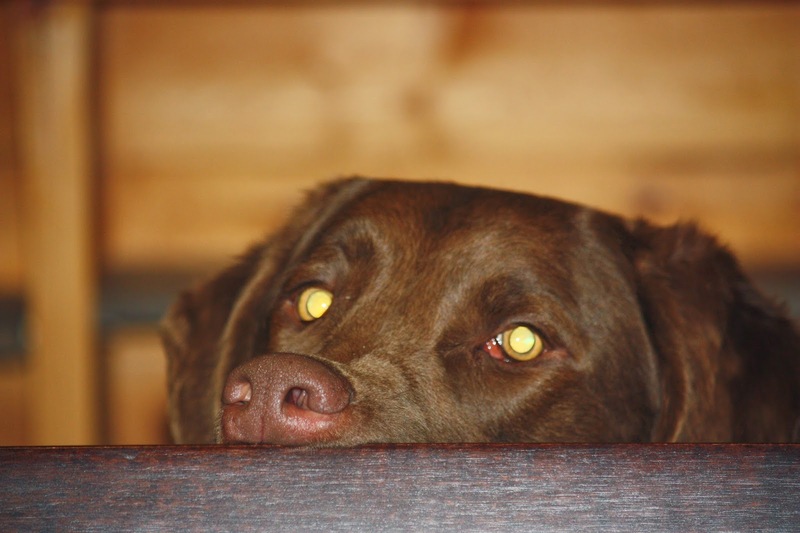 Dogs anxious and barking while children excitedly await the moment when they may extend kindness, love and acceptance of their new loved one. Jan Folk, preeminent Edmonton entrepreneur along with the help of a local marketing company and co-operation of pilots from Global Exec Aviation launched Freedom Flights. To date they have rescued and placed 468 shelter dogs with loving forever homes along with the help of EHS. Charmaine Hammond identified an opportunity to teach Canadians kindness and respect through media attention and message taught by Orange Dog through the Freedom Flights. If we can get people to understand the value of life regardless of breed or age we can teach them the greater message of being kind, respectful and accepting each other. Charmaine realized this starts with children. 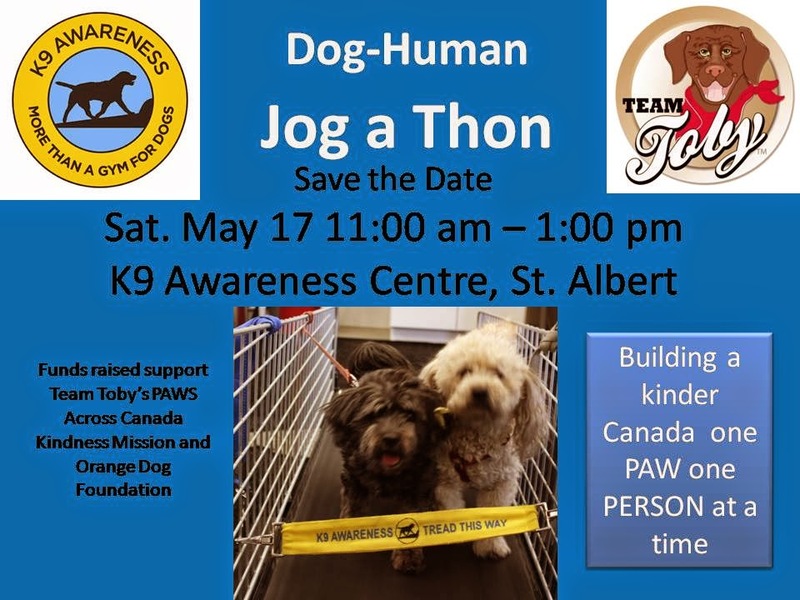 Scroll down to find the Team Toby's Paws Across Canada project (you'll see the photo with RJ and I) and click VOTE. Please ask your friends and family members to do this too, the more votes, the more dogs we help! 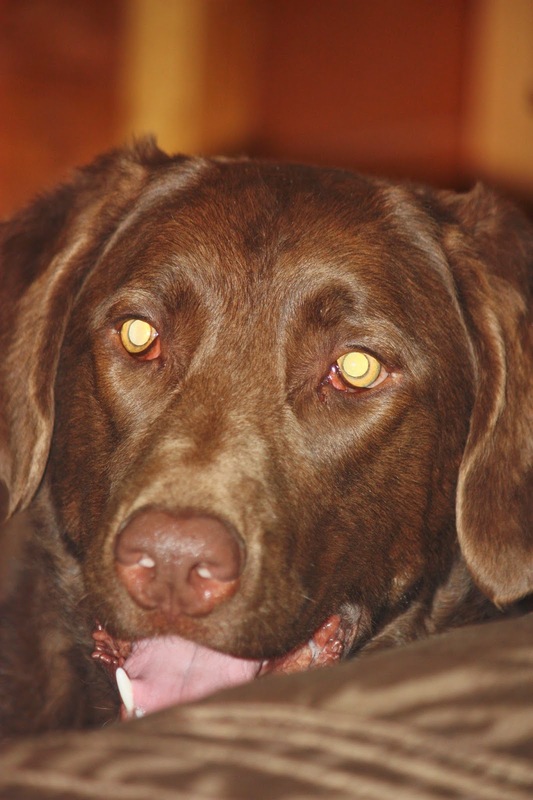 Humans, dogs, schools, workplaces and community groups will benefit from PAWS Across Canada. 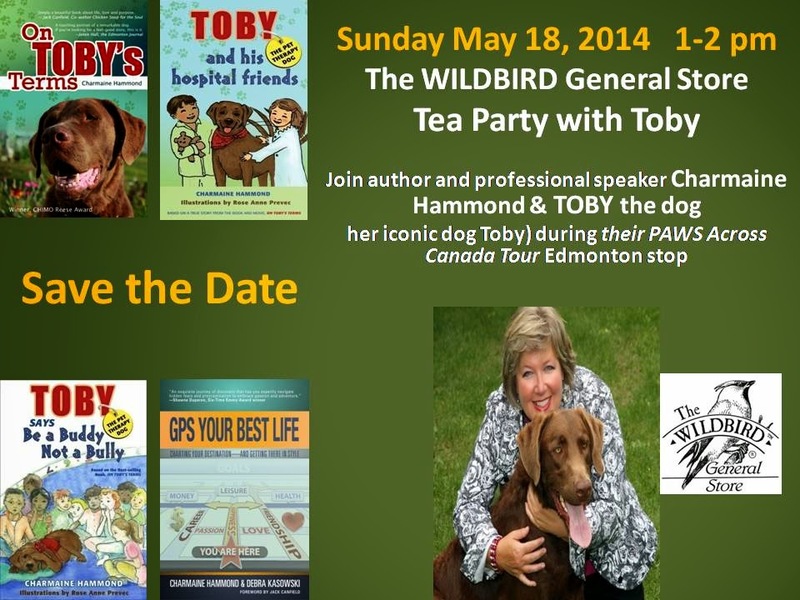 Thousands of students in Edmonton area-northern Alberta will participate in Toby’s presentations, story time with Toby, and his kindness classroom kits. His books will remain in the schools he presents at so future students will benefit as well. The student’s families will also benefit from this project as Charmaine and Toby will work with schools to provide Toby tips for families. The project is built on a foundation of collaboration, partnership and working together to make a difference. 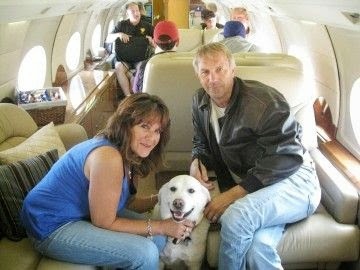 The dogs rescued from the Freedom Flights will benefit, as will the families who adopt them. The chosen animal shelter/adoption organization will also benefit from this project in terms of marketing support and adoption fees. Because the Freedom Flights receive a great deal of media exposure, the animal shelter/adoption organization, and the general public will benefit as the media pours out good news stories, and, learning about dog adoption and rescue. 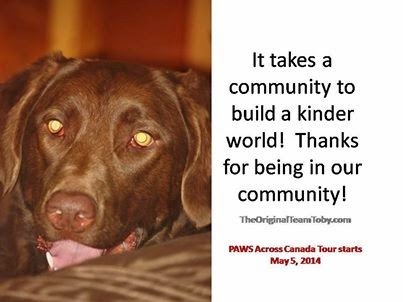 Team Toby appreciates the PAWS Across Canada Partners!! Your support makes a PAWsitive Difference! 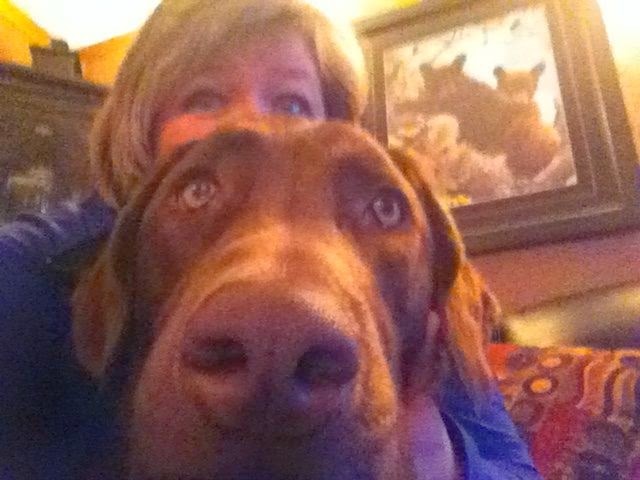 We are one day away from PAWS Across Canada and I can hardly wait! I've been napping all day so I don't miss a thing tomorrow! The Toby Mobile is packed and ready to go! May 5 we leave home, get the Toby Mobile filled up compliments of the Co-Op Gas Bar, then off to Ecole Plamondon School for the official send off! Then up highway 63 to Fort McMurray. Mom talked about the tour plans for week one on Blog Talk Radio, you can listen here. Thanks to our super PAWSsome partners!! Make sure you follow us on Facebook and Twitter for all the live footage from PAWS Across Canada Tour.